This year has been full of so many exciting and nerve wracking adventures both personally and business wise. I was fortunate enough to spend a month over the summer on an epic roadtrip throughout the country checking out awesome musical cities with my husband. I’m not kidding when I say nothing will test the strenghth of your relationship like being stuck in a car for 30 days together. But, I’m happy to report we survived and are still happily married with only a few battle scars to show for it 🙂 We checked out Austin, New Orleans, Memphis and Nashville…as well as some other cool city spots along the way. I thought it’d be cool to do a series of blog posts to share our adventures and travel tips for other wanderlust souls out there. These posts may never be read by anyone but me…and that’s ok. I have a crappy memory so I want to have these little adventures journaled so I can always come back to visit them here. So over the next few weeks I’m going to share our gypsy travels and the stories behind them. And after almost 2 FREAKIN’ years…I’m excited to announce that I will be launching my new website and brand for my business. This process was such a huge undertaking and waaaayyyyy more work than I thought it would be. But, the end is near and there are just a few more tweeks before I go live! Launching this thing has been a labor of love and something I’ve been talking to all my friends about for the past 2 years. I’m so nervous about putting it out into the world! So yes…the horizon is filled with lots of changes…and of course…always with this man in hand. 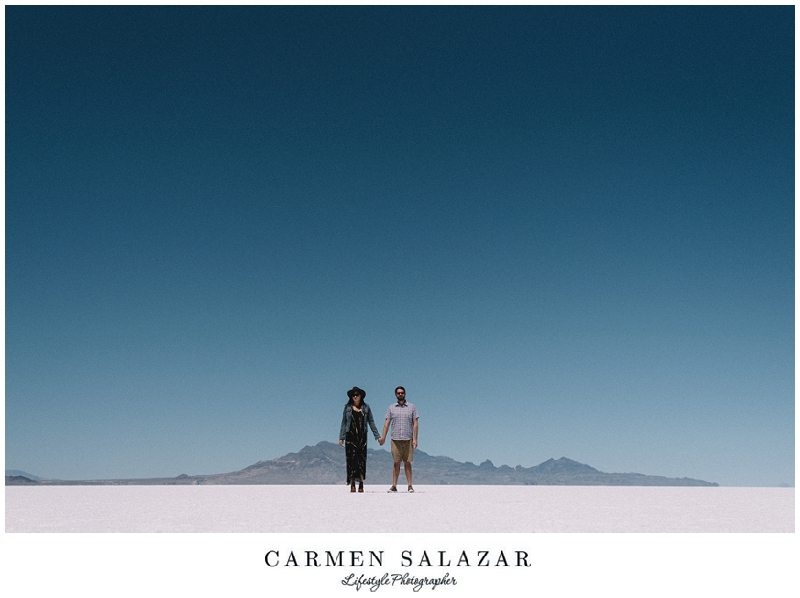 Although we look blissfully happy in this epic Salt Lake Flats portrait – which I have always dreamed of capturing – that was far from our current mood. This was taken on the last day of our drive back to California and Brian was done appeasing my romantic photographic visions. But of course…my wifely charm won out and he stopped the car so we could create this image. Trying to be all tech savvy I tried using the fancy remote capture app to trigger the camera which was laying on the ground. Of course when I needed it to work – it didn’t. So what you can’t see in this photo is the sweat dripping down my face as I sprint back and forth to the camera to put the timer on. Brian is just shaking his head at me the entire time I’m certain wondering how he married such a hot mess. I know I looked so ridiculous to everyone around me…but with an image like…who the hell cares! > Next post : Mamas got a brand new brand!